Looking west from the site of Chinley's first station on the 29th September 1979. The view is taken from a point towards the west end of the station site about three quarters of the way along the site of the southbound platform. Between 1900 and 1902 the line at this point was widened to accolmmodeate four tracks. On the right side of the picture can be seen the stone built waiting room of the 2nd Chinley Station which was located on platform 1. The 2nd stations footbridge can also be seen. To the left of the picture the open ground is the site of the 2nd stations goods facilities. The train in the picture is an enthusiasts special 'The Merseyside Express' that ran from Liverpool to York. 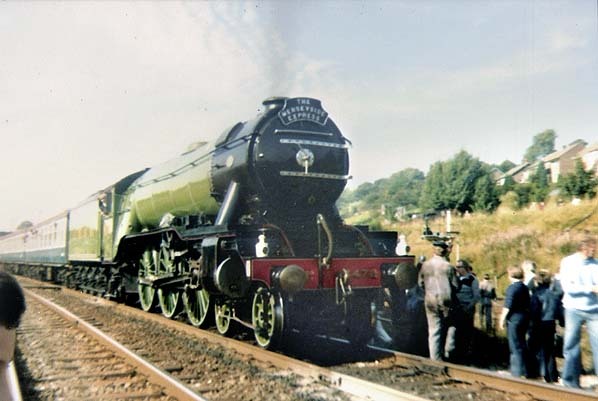 Locomotive 4472 'Flying Scotsman' hauled the train between Guide Bridge and York via Sheffield. It had stopped at Chinley to allow photographs to be taken.